The Union government has been encouraging the construction sector in a big way, as the sector is considered as an ‘engine of growth’. It catalyses more than 265 industries and on the social front, generates the highest employment opportunities and helps increase housing stock in the country. One of the major benefits directly available to the common man is the substantial savings in income tax payable on account of deductions available on repayment of home loan. Let us know the Income Tax deductions available for the present year (financial year: 2016-17: assessment year: 2017-18). Under Section 24(b) of IT Act 1961, home loan borrowers get deduction up to Rs. 2,00,000 pa on the interest paid on the home loan for self-occupied property. If property is let-out, the entire interest paid on home loan is eligible for deduction, after appropriating rental income. Under Section 80EE, additional deduction of Rs. 50,000 is allowed for first-time home buyers for loans up to Rs. 35 lakh. Other condition being the value of property is less than Rs. 50 lakh and loan is sanctioned between April 1, 2016 and March 31, 2017. The benefits of deduction will continue till repayment of loan. 3. Under Section 24(b), the total accumulated interest paid during the pre-construction period (Pre-EMI Interest) can be claimed as deduction in five successive financial years in equal instalments, after house construction is complete. However, deduction is limited to Rs. 2,00,000 pa, on self-occupied properties. 4. Under Section 80C, along with other specified savings and home loan repaid, the amount spent for processing fee, stamp paper and registration cost on registering the house property up to Rs. 150,000 is be deductible from taxable income. The income tax rates for the current financial year for individuals below 60 years of age are mentioned in Table A. On a taxable income of Rs. 960,000 p.a., Anand Rao, 30 years old, is liable to pay income tax of Rs. 117,000 + Rs. 3,510 (education cess) = 120,510. Mr. Anand Rao has purchased a property costing Rs. 50 lakh during this year by taking a home loan amounting to Rs. 35 lakh @ 9.4% interest, with repayment term of 12 years. His EMI is Rs. 40,624. In the first year, interest paid is Rs. 321,990 and principal repaid is Rs.165,498. (Table B). Thus Mr. Rao saves more than two EMIs per year, on account of savings as above. If tax savings are appropriated to the interest paid towards home loan, the effective interest reduces to 6.85%, as per following. Shruthi, 28 years old with a taxable income of Rs. 475,000 p.a. and her husband Krishnamurthy, 31 years old, with a taxable income of Rs. 490,000 p.a., have jointly purchased a 2-BHK apartment costing Rs. 48 lakh, by taking a home loan of Rs. 35 lakh @ 9.4% interest, for 10 years term, with an EMI of Rs. 45,098. In the first year, interest paid will be Rs. 319,616 and principal repaid will be Rs. 221,560. Let us analyse the tax implications separately for Mrs. Shruthi and Mr. Krishnamurthy. On taxable income of Rs. 475,000, Mrs. Shruthi has to pay income tax of Rs. 18,025 including special rebate of Rs. 5,000, since her income is less than Rs. 500,000. 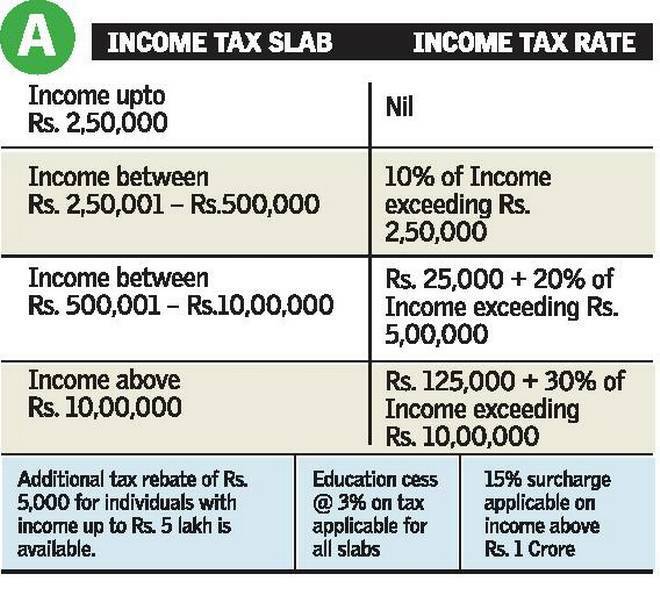 On taxable income of Rs. 490,000, Mr. Krishnamurthy has to pay income tax of Rs. 19,570 including special rebate of Rs. 5,000, since his income is less than Rs. 500,000. Since interest paid on home loan is Rs. 319,616, both Mrs. Shruthi and Mr. Krishnamurthy can claim 50% deduction each (Rs. 159,808) under Sec 24 of IT Act, and both can separately claim deduction of 110,780 (50% of principal loan amount repaid) under Sec. 80C of IT Act. After claiming deductions as above, Mrs. Shruthi’s taxable income gets reduced to Rs. 204,412, and that of Mr. Krishnamurthy to Rs. 219,412, thus for both, tax liability becomes nil. They stand to save tax of Rs. 37,595. Considering the ambitious plans of the Union government such as ‘Smart Cities’, and ‘Housing for all by 2022’ to boost to the real estate sector, it is hoped that there will be more income tax benefits for home loan borrowers in the years to come.